Evidence of Harm chronicles the lives of three ordinary Americans who become reluctant health advocates after suffering from the devastating effects of hazardous mercury vapors generated during routine dental procedures. Randall Moore's feature documentary Evidence of Harm opens for Academy Award®-qualifying one-week engagements at Laemmle's Music Hall in Beverly Hills and IFC Center in New York on October 23 and October 14, respectively. Evidence of Harm chronicles the lives of three ordinary Americans who become reluctant health advocates after suffering from the devastating effects of hazardous mercury vapors generated during routine dental procedures. The film presents a haunting portrait of a dental industry all too willing to turn a blind eye to science while placing profits and politics ahead of the 120 million Americans currently implanted with toxic amalgam dental fillings. Filmmaker Randall Moore began researching Alzheimer's disease after his father was diagnosed with the disease. Finding out that the "silver" dental fillings in his dad's mouth contained 50% elemental mercury and were constantly releasing toxic mercury vapors above established safety levels, he began working diligently as a mercury documentarian. "During my research I repeatedly discovered that our government regulatory bodies have failed to protect the public from this toxic product," said Moore. "After watching scientists present information to the FDA that links mercury to Alzheimer's disease, I became frustrated with our government's refusal to do anything about removing this toxic product from the marketplace. So, I took it upon myself to make a documentary that would alert others of the widespread danger, which hazardously impacts public health and the environment worldwide." Moore came to understand how amalgam dental fillings, all of which contain mercury, could create a national epidemic of poisoned individuals that slip through our healthcare system. "Government reviews of mercury have found it can create nearly 40 adverse health symptoms including memory loss, emotional distress, chronic fatigue, anxiety and depression. Most doctors and patients don't know of these exposures or the adverse health outcomes that are a result of mercury poisoning. Neurological problems, cardiovascular disease, stroke and kidney dysfunction all have well-established links to mercury," stated Moore. Moore found the issue was even worse than what he imagined. 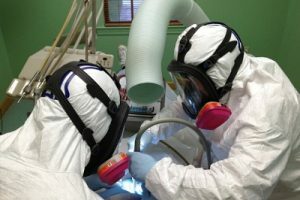 "Because dentists are not aware of the toxic levels of mercury released during the placement, polishing and removal of amalgam fillings, they do not know to protect themselves and are unaware of occupational safety regulations requiring them to inform and protect their staff from toxic exposures," said Moore. You’ll find our online directory here. I also have a mouth of construction and much harm was caused. I had all fillings which were amalgam, replaced. Which led to all kinds of severe problems. I had sky high mercury in a hair analysis and urinalysis. I had IV chelation for heavy metal toxicity in 1999. I also have root canals one with a file stuck in it and one next to a implant which was placed after a perfect baby tooth as an adult was pulled. At that very spot is a painful lymph node that has been there since it was placed. So, If you would like to document another film together with a IABDM Dentist who is willing to remove root canals and the implant and the broken down materials that were placed in my mouth, then get the roots tested for bacteria. I am suffering with Alzheimer’s and have a lot of mecury in my mouth for 50 years! I am 65 now. I do not want to lose my mind!